When size matters then you can select our large meeting room table, which seats 14 comfortably, thanks to the four rectangular and two D-end tables used to design this particular configuration. The tables are sturdy, robust and made from top quality melamine - all for fantastic rates. By picking a time in history and looking at the tables available you may be surprised by the many inventive designs available many, many years ago. Although inventors may have had less innovative machinery and materials available, tables were still created and like lots of inventions were designed to address different ‘issues’. Take the Ancient Egyptians for example, they wanted to stop perishables and valuables from getting contaminated by dust from the ground, so they took what was available, and made platforms from stone for this very purpose. Later on the Greeks and Romans wanted to sit around tables and enjoy their food, while the Chinese required surfaces on which they could enjoy artistic hobbies, such as painting. All these different populations created tables in different ways, some were fashioned from wood, marble or different metals. Still popular thousands of years later! Later in the 15th Century when techniques such as joinery became popular, wooden tables of different shapes and styles were created. Along with trestle tables, refectory tables and a whole host of other similar products made for many different purposes, there was much to choose from! It’s no different today, and tables are just as important now as they’ve been throughout history. 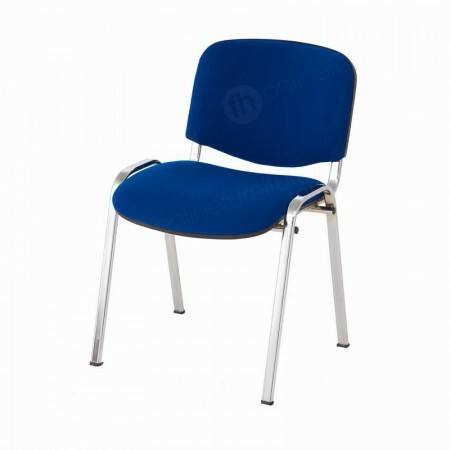 Found in homes, offices, exhibitions, conferences, receptions, schools, colleges and many other locations across the globe they are the cornerstone of many furniture hire in London orders that we take. What’s in a large meeting room table? 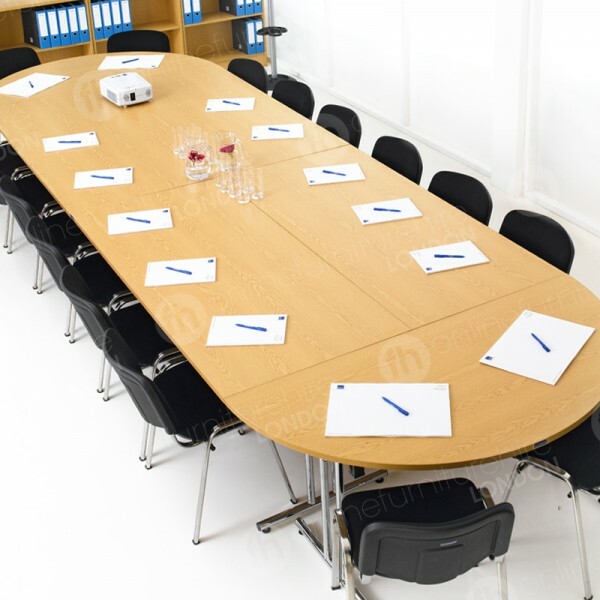 Our large meeting tables are made from four of our 1800mm rectangular tables, and two of our D-end modular tables. In fact, it’s up to you how you configure individual tables, meaning you’re free to create any shape or size your require! 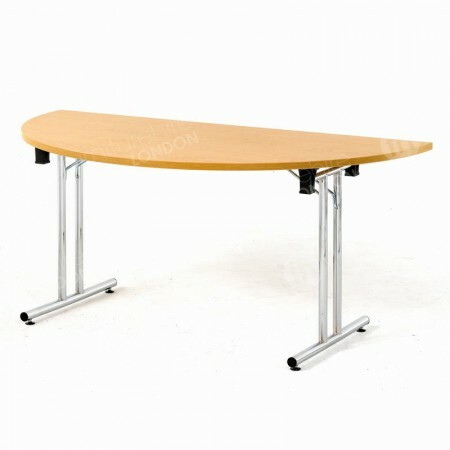 Our large meeting table is popular as a surface for bigger corporate functions and can comfortably sit around 14 people. Just like throughout history, our tables address all issues, resulting in a product that fits your needs! Require tables that can be easily transported, stacked and stored? Ours fold flat… when you want easy-to-install products, then you’ll love our tables as they’re set up in seconds, while the premium 25mm melamine surface is robust and has a light oak finish that not only looks very stylish, but is resistant to heat and marks. 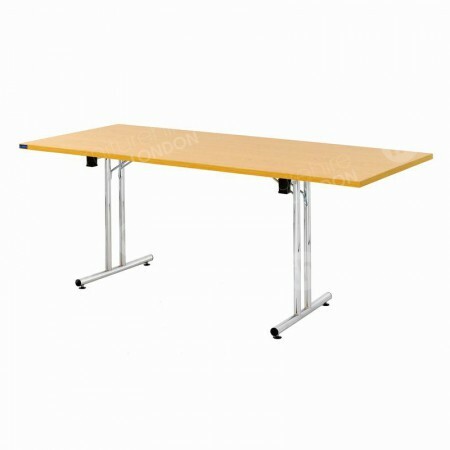 In fact, we’ve had all the modular tables that make-up our larger meeting table hire range manufactured to our high specifications. We purposely included high grade materials and easy-to-install folding leg mechanisms, so you get top quality products for all your locations and events - and here’s another top benefit, they attract fantastic rates too. How quickly can I set up entire tables for impromptu meetings? Very. We’ve had these tables manufactured to our high specifications, all you need to is unfold the legs and they’re ready to be used. Are they easy to store when they’re not in use? Yes, simply fold the legs and stack them - it’s that easy!